Chrysanthemum is blooming in the late autumn. Most of flowers withered in the frost, it stands out the strength and fortitude of chrysanthemum. 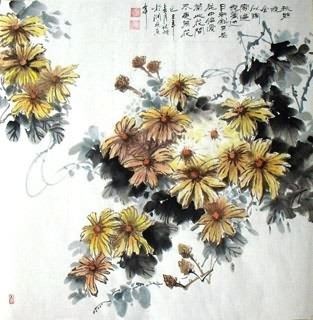 Chrysanthemum is one of the famous flowers in traditional Chinese culture, and they are the most common themes in the Chinese poems and paintings. 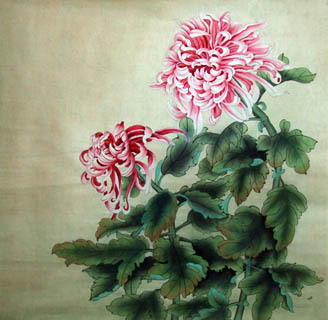 In ancient myth and legends, chrysanthemum painting had the meanings of auspiciousness and longevity. 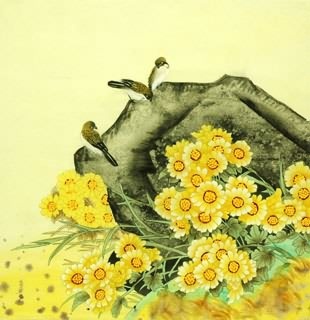 Chinese Yellow Siskin & Chrysanthemum Painting: Ju Jia Huan Le(举家欢乐). 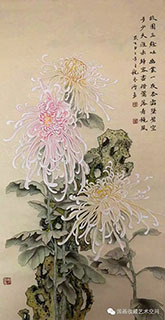 "Chrysanthemum(菊)" and "the whole(举)", "yellow(黄)" and "joy(欢)" have similar pronunciations in Chinese. So this combination is called "The Happy Family(全家福)". 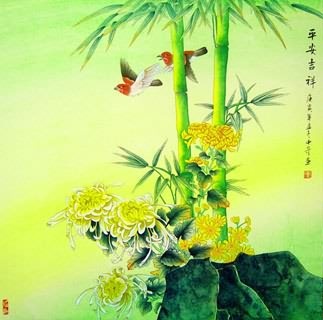 Chinese Pine Tree & Chrysanthemum Fengshui Painting: Song Ju Yan Nian(松菊延年). Pine tree and chrysanthemum. Also called "Song Ju You Cun(松菊犹存)". 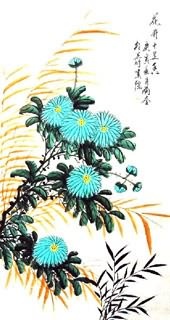 Pine tree and chrysanthemum don't wither in the cold winter, so this combination symbolizes "keeping the noble character and the spirit of perseverance in the tough time". This combination also symbolizes longevity. 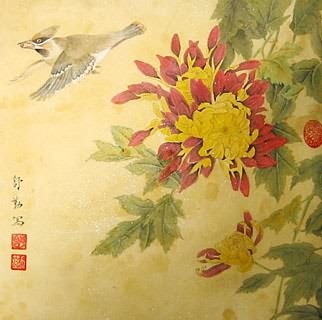 Chinese Quail & Maple Tree & Chrysanthemum Fengshui Painting: An Ju Le Ye(安居乐业). 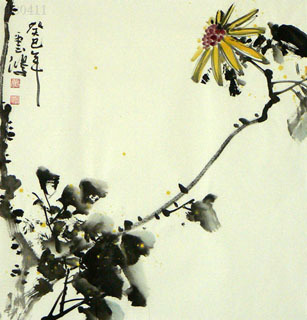 Quail, chrysanthemum and maple tree with fallen leaves. 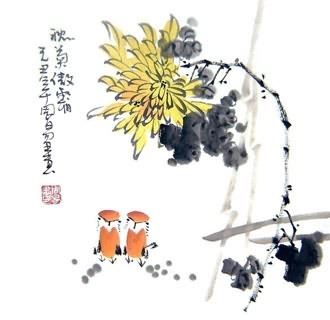 "Quail(鹌)" and "peace(安)", "chrysanthemum(菊)" and "residence(居)", "fallen leaves(落 叶)" and "working happily(乐业)" are homonyms in Chinese, so this combination symbolizes "living and working in peace and happiness". 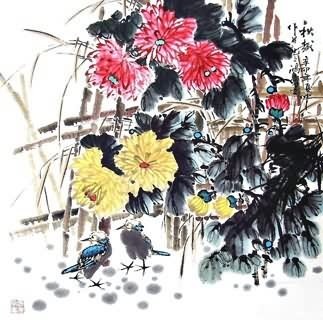 Chinese Nine(9) Quail & Chrysanthemum Feng Shui Painting: Jiu Shi Tong Ju(九世同居). Nine quails mean "nine generations(九世)", and "chrysanthemum (菊)" symbolizes "be (in a certain condition)" (居), so this combination means "nine generations of a family living together", it implied a long lineage for the family and the prolific offspring. 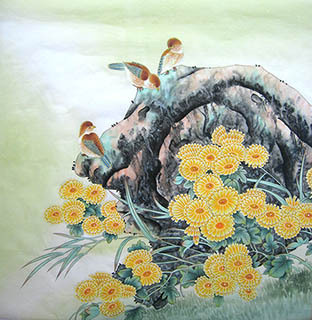 Chinese Chrysanthemum & Stone & Butterfly & Cat Feng Shui Painting: Shou Ju Mao Die(寿居耄耋). Stone symbolizes longevity; "chrysanthemum(菊)" sounds like the word "residence" or "be (in a certain condition)" (居). "Cat(猫)" and "buttefly(蝶)" sound like that of "octogenarian(耄耋)" in Chinese. So the whole combination means longevity. 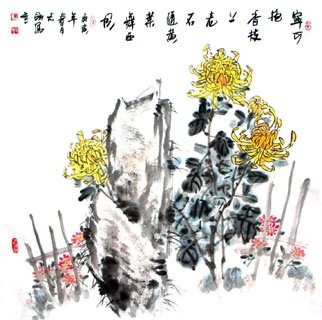 Chinese Grasshopper on the Chrysanthemum Painting: Guan Ju Yi Pin(官居一品). In Chinese, "grasshopper(蝈)" sounds like the word "officer(官)", so it symbolizes public office. "Chrysanthemum(菊)" sounds like the word "residence" or "be (in a certain condition)" (居). "Yi Pin(一品)" means the first ranking official position in feudal China. And grasshopper is good at jumping, so it implied "getting promotion soon". In feudal China, this combination symbolized high rank and salary.